Hype is a dangerous thing. When it’s PR-generated, we’re all naturally suspicious, but word of mouth is usually so much more reliable. After hearing excellent reports of Chiang Mai Kitchen for several years, I was thrilled to be invited to a work dinner there. It’s probably the priciest of Oxford’s Thai restaurants, so I’d been saving it for a celebration (or February at least), but thankfully there was no need. Walking in at 8pm with high expectations, I was glad we’d made a reservation: the place was packed. Nothing unusual for a Friday or Saturday evening – but it was Monday. We were shown to the last free table in the restaurant’s cosy upstairs. Set in a historic building, Chiang Mai is charmingly higgledy-piggledy, its oh-so-English wood-beamed dining area given a Thai touch with the addition of gold statuettes. Glamorous it isn’t, though: tablecloths are the paper variety and the menu was well-thumbed and spiral-bound. I wasn’t impressed to note a stain on our tablecloth – yes they were busy, but surely there was time to quickly exchange a sheet of paper? The menu quickly improved my opinion though. If you’re indecisive, you’ll find dining at Chiang Mai a challenge: there are just so many tasty-sounding dishes to choose from. With a page each, starters and salads are manageable, but when it comes to the main event, there are options galore – chicken, pork, beef, seafood, fish, vegetarian dishes, curries; it’s all covered. There’s something for all palates too – spicy dishes are indicated with chillis; 1 denotes medium spice and 2 is seriously hot. With starters ranging from £5.60–7.90 and mains between £8.30 and £14.50, it was less expensive than I imagined – but of course, the price of noodles or rice (from £2.70) must be factored in. After a good ten minutes ruminating, we placed our orders. 45 minutes later, as the other diners had almost all emptied out of the restaurant, we were still waiting to eat. After some prompting, our starters appeared. M and I had both opted for the tofu (£5.60), which was deep-fried and served with a spicy peanut sauce. Thank goodness for the sauce – we both agreed the tofu was bland and a little watery in the middle, as though it had been sitting around for a while rather than jumping straight from the fryer to our table. The portion was generous, though, as was C’s Mieng Gai (minced chicken with spinach, £6.60). This dish was particularly well-presented (apologies, we were too ravenous to care about photography at this stage), the spinach leaves forming a pretty floral pattern on the plate. She was surprised to discover it was served cold, though. The peanuts sprinkled on top certainly gave an extra dimension, but were whole rather than chopped, overloading the dish somewhat. The chunks of lime also included were a more successful touch, adding a fresh flavour. Unlike the Mieng Gai, S’s fishcakes were hot: both in terms of temperature and spice. With 4 pieces, this was another sizeable starter, and was complimented on its taste. Fortunately our mains arrived more speedily than our starters. Perhaps a little too speedily – C’s and S’s sizzling prawns would have been more aptly described as lukewarm. Rather than hissing and spitting on the plate, they just…sat. Both agreed they were tasty enough, with a mild flavour, but the taste didn't make up for the temperature. My Pad Phek Pak (stir fried vegetables with curry paste, green peppercorns and Thai herbs, £7.70) was flavoursome thanks to its sauce, but I did feel that some of the vegetables were undercooked, particularly the baby aubergines. I thought this was a shame, as given the variety of veg and the taste of the sauce, it could have been a good dish. M’s green chicken curry (with 2 chillies) was the most successful (but least photogenic) main, with a good depth of flavour and a sufficiently creamy consistency. Although spicy, it wasn't uncomfortably so. After the late starters and mixed bag of mains, we had nothing to lose by trying Chiang Mai’s desserts. Lemon sorbet, mint chocolate bombe, pistachio ice cream and chocolate fudge cake may not have been traditional, but they were successful. Universal praise at last! Yes, most of them were straight out of the freezer, but the fudge cake’s sauce atoned for C’s not-so-hot experience so far – warmth at last. I really wanted to like Chiang Mai. I certainly expected to like it, following so many positive reports from friends whose opinions I trust. But the food failed to impress and the service was slow and indifferent for most of the meal. I can only assume that they were having an off day or hadn’t anticipated the volume of visitors on a Monday evening. I know my experience can’t be typical, or Chiang Mai wouldn’t have lasted almost twenty years and won itself a legion of fans. But I’m sorry to say I won’t be joining their number. 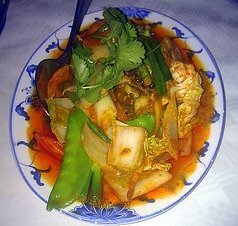 Chiang Mai Kitchen is at 130 High Street, OX1 4DH. Tel: 01865 202233. Haven't been for a while but I quite agree: people always seem to talk about Chang Mai as if it's some kind of undiscovered gem, but in my experience it really isn't. Odd! I know that Asian restaurants quite often have long menus and manage fine, but with all that choice maybe they're trying to do much much. Been going their occasionally for years, on all different days of the week, and I have 'never' had a bad experience, in my opinion the best Thai restaurant in Oxford by far. Quite surprised to read this review Kate. I've been going to Chiang Mai for years too, much like the other comments, and have never had a bad meal or experience. Once you've eaten your way round Oxford, please give it another go ! I can solve this mystery by reporting that I've been there on both a lovely, wonderful evening, followed by two very poor ones. I think it's a question of picking your timing and knowing what to order, but the difference in enjoyment between my various experiences was admittedly bizarre. This was exactly my experience! High expectations because of rave reviews, and then a fairly mediocre meal. Maybe it's down to the chef or staff - someone needs to get their hands on a copy of the rota in advance of booking! Well, I'm definitely not the only one! It sounds like inconsistency is the norm, sadly.